It’s a few years since I last visited the Heaton Motor Company in Wigan, shortly after they had completed the upgrading of their premises on Bickershaw Lane in Abram. 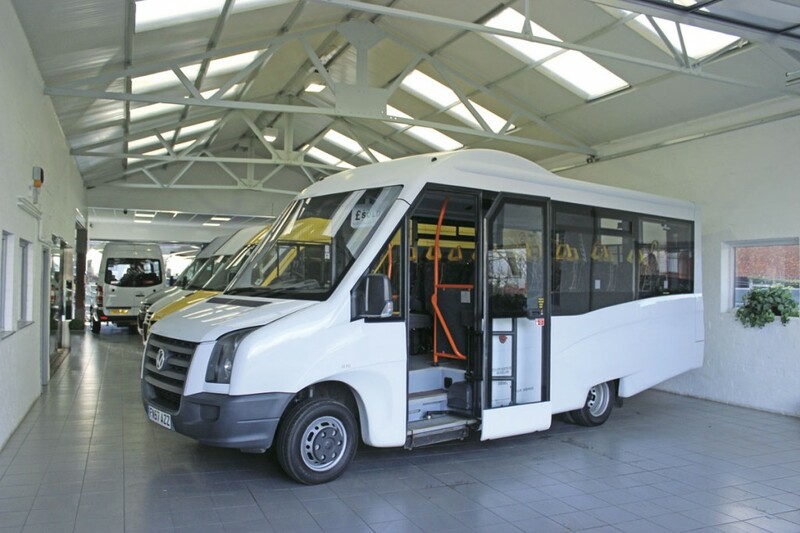 That upgrade gave them a facility to be proud of, presenting potential customers with an atmosphere in which to look at used minibuses and minicoaches that, in my experience, is unsurpassed. 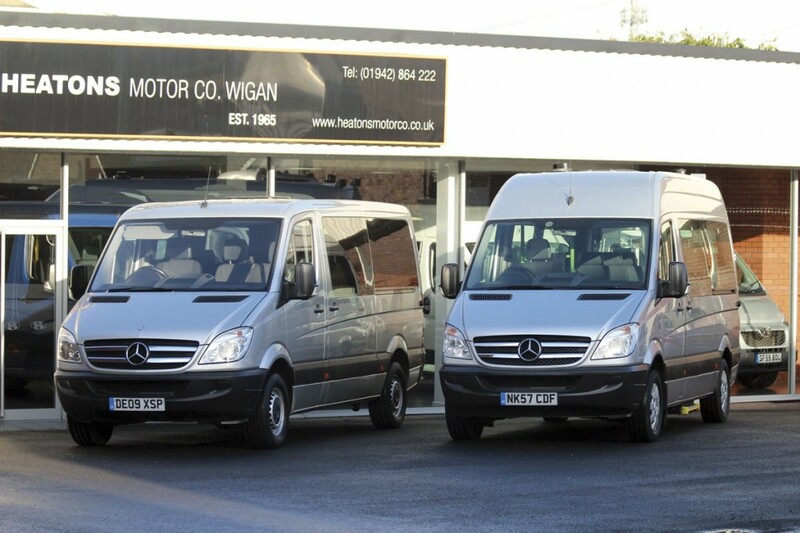 As I arrived, Terry Young, proprietor of VIP Taxis Ltd of Marple, Stockport, was collecting two used Mercedes-Benz Sprinter minicoaches that he had just purchased. The pair, a 57 plate wheelchair accessible Frank Guy nine-seat 309 conversion and a 59-plate 313 nine seater, join a fleet of 35 taxis and minicoaches that Terry has built up over the last seven years. His comments sum up the experience of buying from Heatons. He said, ‘You never ever go to a place like this that is as well presented. You just have to look at the stock. It’s all good clean stuff. It sells itself. You get excellent service from them and they’re always friendly.’ Terry had brought from Heaton’s before, some time ago, acquiring 16-seat wheelchair accessible buses. Proprietor, Wayne Heaton and his right hand man, Phil Broadhurst thinks Terry’s experience is a typical one. ‘Everyone says how clean and tidy everything is and how modern it is. They don’t expect it to be like this when they arrive with everything under cover. Sometimes they comment on the premises before the buses they’ve come to look at; it happens a lot.’ He thinks the attention paid to presentation and the standard of the showrooms pays off in attracting customers. Heatons pride themselves on always maintaining a varied range of stock to offer and ensuring that it is in ready to go condition. Up to a dozen examples of the newest stock are displayed within the showroom facility at the front of the premises with all other vehicles lined up in echelon along each side of the long tarmac yard to the rear of the premises. If it is known that a customer is coming to view a particular vehicle that would normally be kept outside it can be moved into the workshop for them to look at. As you can see from the pictures accompanying this article, the external presentation of the vehicles is very good with the same true of the interiors. 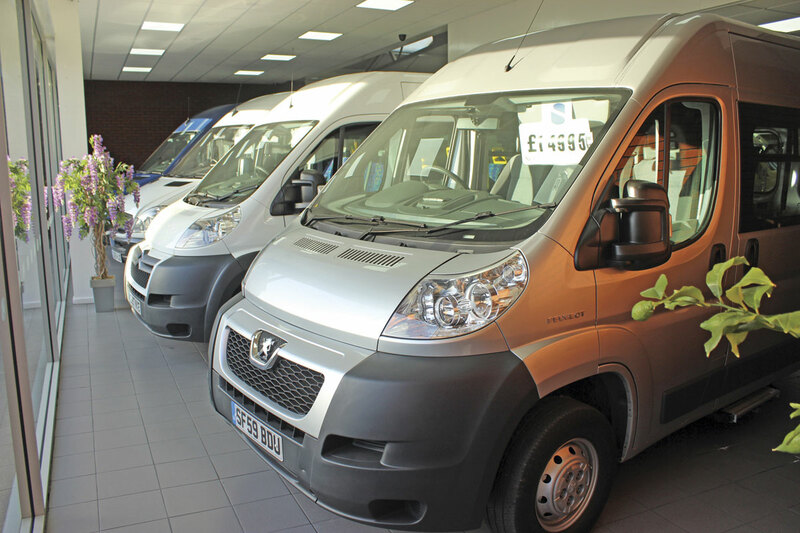 Vehicles in stock included a selection of 2007-2010 Renault Master LWBs with eight or ten seats, Vauxhall Movanos, a considerable variety of Irisbus Daily models, a Citroen Relay, a number of 300 and 500 series Mercedes-Benz Sprinters of differing capacities, Varios, a Peugeot Boxer MWB and a 07-plate LDV Maxus with ten high back seats on tracking. Two of the more unusual offerings were a Mellor Parice bodied VW Crafter and a UVG Treka bodied Ford Transit. I was surprised that several of the vehicles available had accumulated astonishingly low mileages in their earlier lives. In terms of the age profile, you are not going to find anything decrepit on offer because it is not what customers are looking for. Age limits depend on the size of the vehicle with higher capacities justifying a slightly broader age spread. Larger vehicles will be no older than 2004 while for eight seaters with wheelchairs it’s got to be 57-plates or later. Exactly which marques of vehicle are offered at any time depends entirely on what is available at the time. 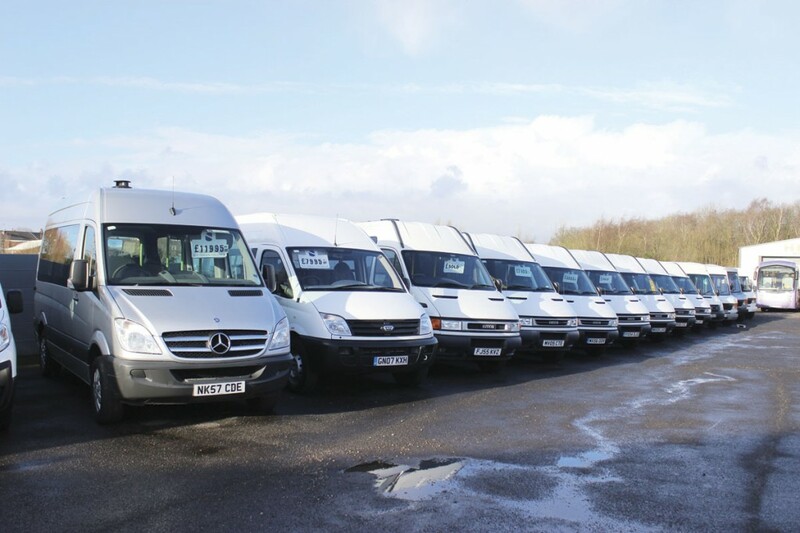 Currently there are a lot of Renaults and Ivecos but two months ago there were over 20 Mercedes-Benzes on offer including a batch of 12 58-plate Sprinters with coachbuilt UVG Treka bodies as well as a selection of van conversions. ‘Clean honest stock from quality converters and good homes will always sell. There are some places where even late stock will not be in the condition we want to offer, so we don’t buy it in,’ said Wayne. The demise of the Vario from the new market has not had any impact. On the used market there is still demand for clean Varios. Matching specifications to likely demand is part of the skill of the dealership role. 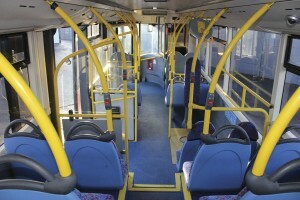 ‘I tend to shy away from larger buses with minimum seating because people buying a bus want maximum capacity,’ he said. 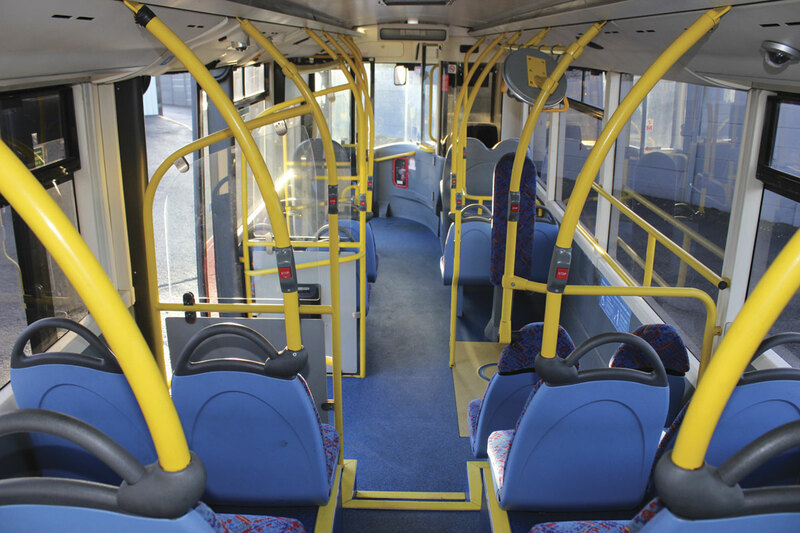 Vehicles such as Optare Solos are already being handled, with half a dozen dating from between 2004 and 2011 sold last year. All were wide bodied and some had as little as 30,000 miles on the clock. 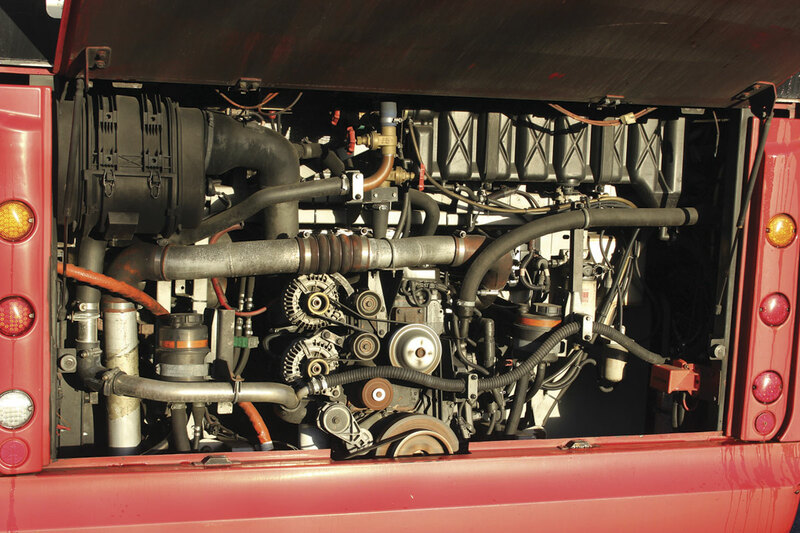 Wayne couldn’t remember which had which engines but said that operators weren’t bothered whether they had Cummins or Mercedes-Benz engines as long as the bus was clean. As vehicles continue to develop, the changes are reflected in the stock held. 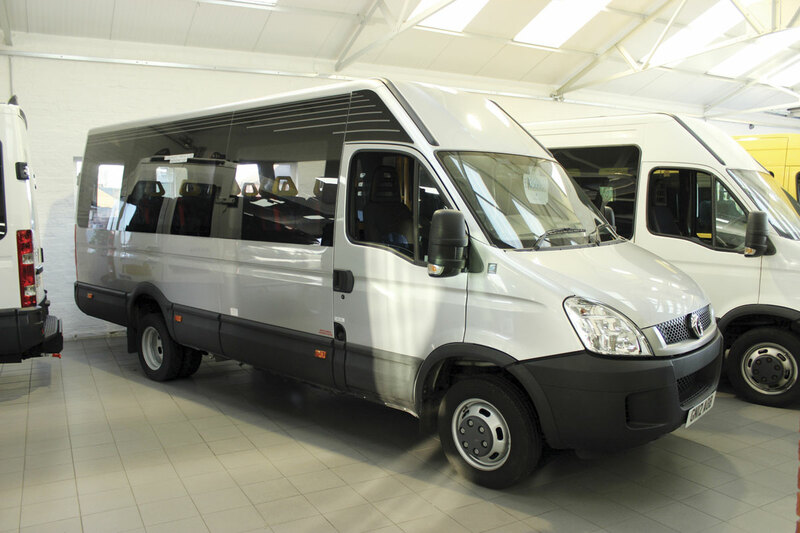 A more recent trend noticed is that some of the more recent minibuses have aluminium framed seats, something that is noticeable when you pick them up. Not all operators move forward at the same pace, as Wayne has noticed. 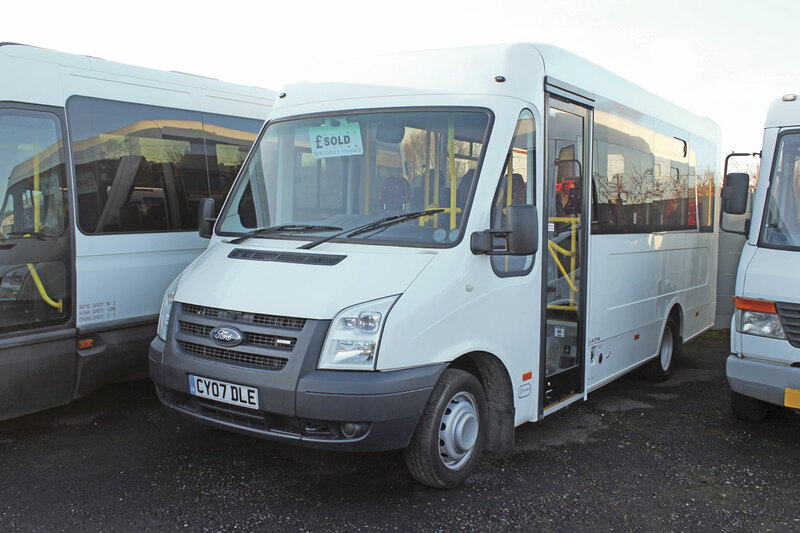 ‘It still surprises us how Councils offer us used minibuses dating back to the 1990s that they are still running. You get offered 1995 Transits and you wonder how they can still be running anything that old,’ he said. Heatons have always offered the odd full sized coach if it represented a good deal. 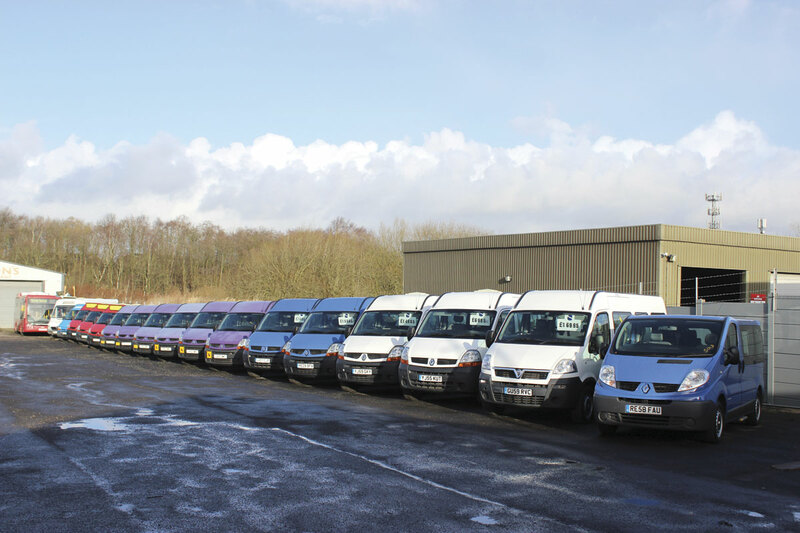 Wayne once bought five ex RAF coaches in one batch, which sold successfully but weren’t popular with the team because of the amount of valeting involved. 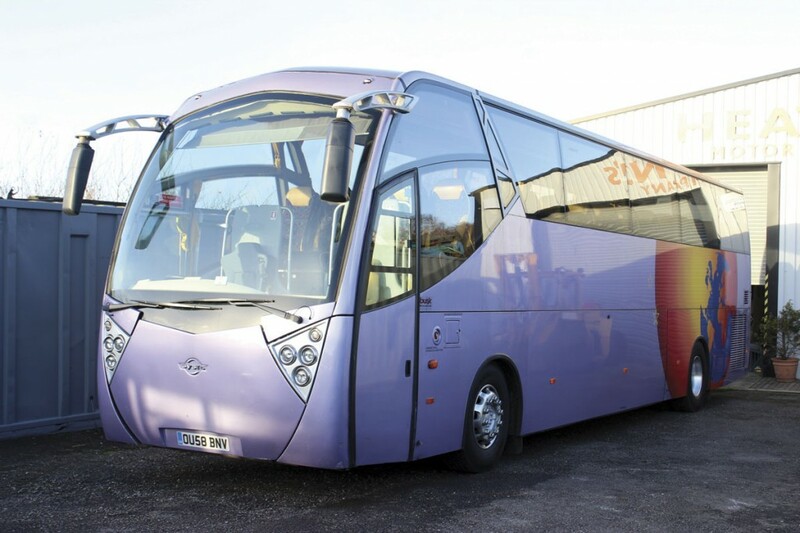 Recently offered was a rare and distinctive 58-plate MAN-powered Ayats Platinum integral 53 seater with large toilet that had only covered 246,000km. The finance on its sale was close to completion when I visited. 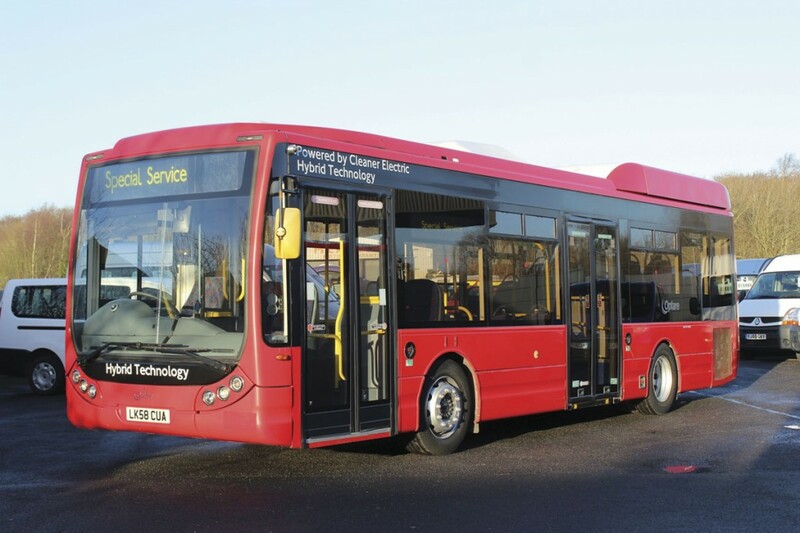 A significant deal last year involved five Enviro300s bought as a batch from a local authority. Their sale was rapid. Within hours of their appearing in advertisements, all five were purchased by a Welsh operator. Wayne would like to offer more buses and coaches in future but would be more interested in taking a selection of buses than coaches. One very unusual bus in stock when I visited was a 10.6m long, dual-door, 58-plate 2009 Optare Tempo hybrid that had been new to Metroline for TfL contracts, seeing use on routes E8 and E9. In addition to the batch of five for Metroline that were the first hybrids built by Optare, a further five were delivered to East London. It seated 28 and was certified for a further 47 standees. 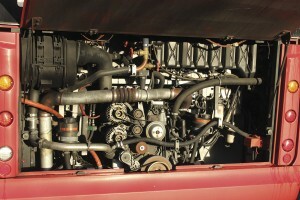 Still in London’s red, but with the original green leaf foliage vinyls removed, the bus features an Allison EP40 parallel hybrid drive system combined with a Cummins ISBE 250hp Euro5 engine with SCR technology. The system uses NiMH batteries mounted on the roof, contributing to a ULW of 10,720kg. It had yet to be valeted, but the interior was generally tidy with a little delamination of the floor coverings around the wheelchair bay and the rear engine hatch. Wayne and Phil bought the Tempo simply because it represents such good value for money for a late midibus. They don’t pretend to understand how all of the hybrid elements work but Wayne, who drove it to the yard, reports that is very smooth and quiet on the road, ‘It drove like a car, and that was empty.’ When Paul moved it around the yard for my pictures it ran well though it appeared to be operating solely in diesel mode at that stage. 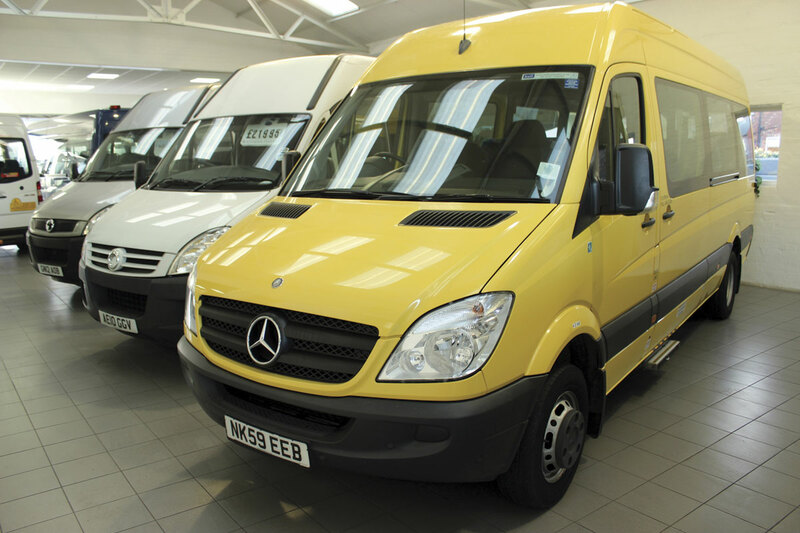 For someone needing something with eco credentials on a limited budget it’s a lot of bus for a retail price of £19,950. Unsurprisingly there was a lot of interest and the bus was sold on the day after my visit. Possibly more unusual than the five Enviro300s or the hybrid Tempo was a lengthened 2010 Iveco Daily 50C17 with 22 seats and a glazed power door sold last year, as neither Phil nor Wayne have ever seen another minicoach like it. ‘It was like a stretched limo,’ they commented. The operator that purchased it has said that he would like to buy more but Wayne will be surprised if he manages to find him any. Many years ago the business once handled a Bedford OB that museum wanted to dispose of. Wayne went to collect it with a tow-truck and the boot fell out on the way, depositing spare parts all over the road. A member of staff rebuilt it and it was subsequently sold. Another older purchase was 1958 East Lancs bodied Tiger Cub that had been specially made to go through the entrance of a prison. It started on the button and was kept for five years but it took up too much room and was sold. The stock may be completely different to that present at the time of my last visit – there certainly weren’t any hybrids about at that time – but in all other respects everything was the same. An extensive variety of good vehicles is matched by the quality of the premises and the welcome – even the five strong team is the same. It’s perhaps no wonder given this solidity that a lot of business is done on trust and, despite an ever growing list of new customers, repeat purchases continue to account for the majority of sales. Some customers have been coming back for over 20 years and there are no plans to change the formula to discourage them from doing so.